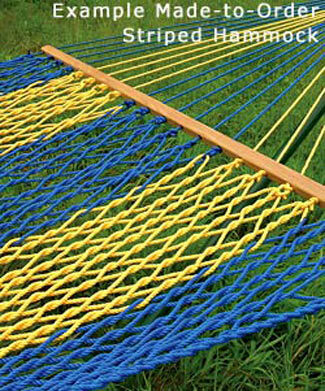 Combine any two of our hammock rope colors within the same family sized traditional woven rope hammock. Striped Hammocks alternate two rope colors in broad stripes in the bed and harness of the hammock. Allow two weeks for your custom order hammock to be shipped. These made-to-order rope hammocks are otherwise identical to our traditional rope hammock line. Note: We generally put the darker color on the outside of the hammock. If you want yours done differently, please request so in the order comments at checkout or place your order over the phone at 1-800-688-8946. Bed size approx. 7 ft. x 5 ft.Overall length approx. 13 1/2 ft.